Nový slovenský breakbeat je na svete. Tentokrát aj s remixami z Veľkej Británie. Macho, Home Alone, Andy Faze a One of Bra. Tieto producentské mená nájdete na novom EP z dielne Breaks.sk Records. Originál je od Macha (Breaks.sk, VIM Records, Digital Sensation UK). Dva remixy sú od producentov z Veľkej Británie: Home Alone a Andy Faze. Prvého nájdete na labeloch ako Dead Famous, VIM, Dusted Breaks a mnohých ďalších. Druhého tiež na VIM a First Stage Records. One of Bra je slovenský producent, ktorý sa spolu s Machom predstaví ako formácia Brabeats na tohtoročnom festivale Rotor. Release je dostupný v 39 eshopoch, kompletný zoznam nájdete na webe breaks.sk. Tracky z releasu sa už dočkali podpory od djov zo zahraničia a môžete ich počuť na internetových rádiách NSB Radio, Fresh FM a Ibreaks radio. Previews v plnej dĺžke nájdete na Soundcloude. 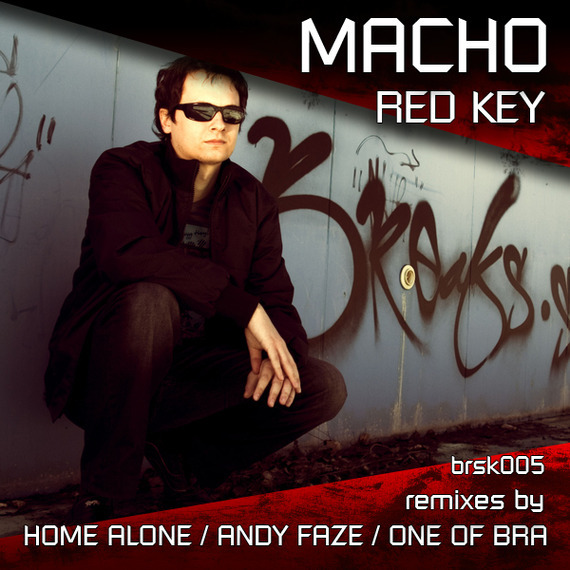 Favourite Track : MACHO : Red Key (HOME ALONE remix) / (Andy Faze remix) / (original mix) Rating: 4/5 Comments: I will support in my Kultura Breakz show (iBreaks radio) in the next weeks and also in my live sets. Really good single!! original and all remixes are class!! ANDY FAZE did a well driven Psy-Breaks one while HOME ALONE and ONE OF BRA did phat and dirty powerfull ones!! Support…..
Really loving the original of Red Key, the tune has a great vibe will defo be getting some air play from me! love what dino has done here. he keeps getting better and better, and im loving it. home alone 4 prez. ez! big ups Macho ;) Home Alone remix rocks! But hypnotic original wokrs also well. Hi guys, cheers for the promo. Andy Faze’s mix is my favourite on this package, lovely fat rolling bassline and great progression, will definitely be playing this one! Yeah! This is Macho style. Groovin‘ bass, brilliant lead, fast rhythmical beats. Oh, stylish remixes. This is louder tracks. I listened to this release in the car and went with speed of 200 km/h. It’s beautiful and dangerous! Don’t try to repeat it. Hehe! But it’s driving me when I listen it!